More Democrats Press Va. Gov. 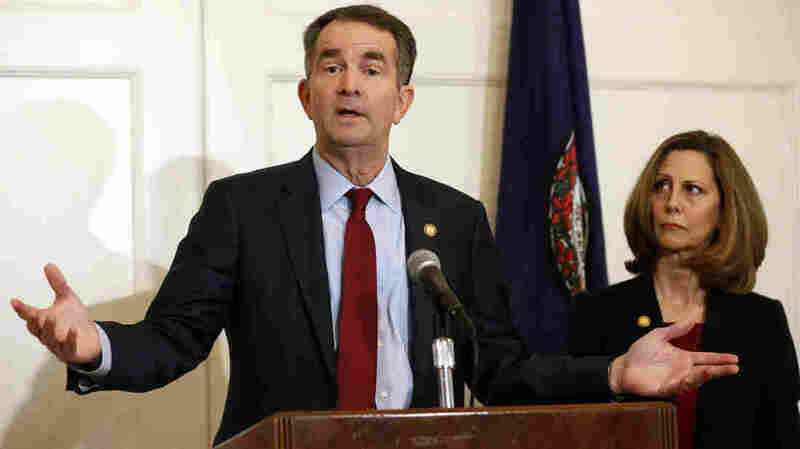 Ralph Northam To Resign Northam has so far resisted widespread calls for him to step down after the revelation of a racist photo on his 1984 medical yearbook page. Virginia Gov. Ralph Northam, accompanied by his wife, Pam, speaks during a news conference on Saturday. Northam has resisted widespread calls for his resignation. Former Virginia Gov. Terry McAuliffe appeared Sunday on CNN's State of the Union, and said resigning is "morally the right thing to do." Northam was lieutenant governor under McAuliffe. Virginia Democratic Rep. Donald McEachin told NBC's Meet the Press, "I haven't spoken to him since Friday, I believe. And at that time he was apologetic for having been in the photograph and that sort of thing. So, I was really surprised when the next day he comes out and says it's not him." So far, Northam has resisted calls for his resignation, and in a press conference Saturday said he didn't recall appearing in the photo and that he was neither of the two individuals depicted on his yearbook page, one dressed in blackface and another as a member of the Ku Klux Klan. This despite acknowledging on Friday that he was in the more than 30-year-old image. He added that while he did not recall that photo, he did remember dressing in blackface as Michael Jackson for a dance contest at about the same time the yearbook was published. On Sunday Rep. Karen Bass (D-Calif.), chairwoman of the Congressional Black Caucus told NPR's Michel Martin on All Things Considered: "The governor has absolutely no credibility. One day he comes out and says, 'I apologize for the photograph that I was in,' and the next day, he goes, 'Well, no actually, it wasn't me, but I actually did do blackface that same year, but it was because I was imitating Michael Jackson, and I'm sure you see the difference between the two.' No we don't." Bass continued, "The way he has characterized 1984 ... 1984 was an exciting year. Jesse Jackson was running for president. Nelson Mandela, we were hoping would be released. There was heightened racial consciousness, and for him to dare say, that during that year, during those times, blackface was common is just an outright lie. So I do not believe the governor has any credibility at all." Some of Northam's graduate school friends say they are shocked by the photo. Walter Broadnax, a retired neurologist who is African-American, graduated with Northam in 1984. He told NPR he was shocked to see the "abhorrent" yearbook photo as, in his recollection, "the campus was not racist." "I can't explain the pictures," he says. "Ralph, back then and even now, is not a racist." Harvey Rawls, who was friendly with Northam during their time at Eastern Virginia Medical School, says he's "extremely skeptical" that Northam is one of the people featured in the photo. He says that while it's possible that Northam was "insensitive enough to be in a photo like that 30 years ago," the image does not gel with the man he knew. "Ralph Northam is not that kind of person," says Rawls. Mark Janczewski graduated from Eastern Virginia Medical School two years after Northam in 1986. He says he remembers the campus being progressive for the time. "It was a tolerant, diverse campus," he recalls. "We had a pretty fair ethnic diversity within our class. ... Any displays of racism would have been anathema." That such a blatant display of racism somehow ended up getting published puzzles Rebecca Haley, a hematologist in Seattle who graduated medical school with Northam. At the time, Haley says, the lessons of the civil rights movement were still fresh in students' minds. There were orientations for the incoming freshman on tolerance and diversity. "It was certainly not an enclave of prejudice," she says. "This is a total anomaly." The racist photo, she says, "was obviously some kind of joke." Haley adds students in the class were asked to send in their own photos to the school's yearbook. Others, she says, would not have been able to submit pictures on your behalf. Democratic party leaders in Virginia told NPR they are also still grappling with the revelations about Northam. Lamont Bagby, the Democratic chair of the Legislative Black Caucus in Virginia, said the photo's revelation was a "real gut check" because Northam was so well-regarded. "We absolutely love the man." Bagby said he is still in shock, and "reconciling the man that [Northam] was, and the man that he is today. I can't imagine the man I know today participating in that." The photo "represents hate in the worst way," Bagby said, adding it's been "very painful, for many members of my caucus, that actually can recall being rushed from the home because of a threat from the Ku Klux Klan." Bagby said for members of the African-American community and many people in the commonwealth, "black face was never acceptable and it is not acceptable." Northam's press conference "missed the mark," Bagby said. He called the press conference an opportunity "for him to resign gracefully and we are disappointed that he didn't do that." Party leaders wanted to give Northam "space to resign on his own terms," according to a senior congressional staffer for a Virginia Democrat who spoke with NPR. "However, he seems to be digging in his heels"
The staffer pointed out that Lt. Gov. Justin Fairfax, who would assume Northam's place if he steps down, is the descendant of slaves, and will help in the healing process for the state and party. I have come to know Ralph Northam as a good, very decent man. I regretfully conclude that he does not now have the ability to effectively govern and effectively stand for the issues - moral and political - that Virginia and the nation must confront. The Governor should resign. In a joint statement on Saturday evening Senators Mark Warner, Tim Kaine and Rep. Bobby Scott (D-Va.) said, "We no longer believe he can effectively serve as Governor of Virginia and that he must resign." "Governor Northam has served the people of the Commonwealth faithfully for many years, but the events of the past 24 hours have inflicted immense pain and irrevocably broken the trust Virginians must have in their leaders," the lawmakers said. "He should step down and allow the Commonwealth to begin healing." Early Sunday morning, former Attorney General Eric Holder, a prospective Democratic contender in the 2020 presidential race, described Northam as a "good, very decent man" in a tweet. Holder went onto write that he "regretfully" concludes Northam "does not now have the ability to effectively govern and effectively stand for the issues - moral and political - that Virginia and the nation must confront." Former Democratic presidential candidate Hillary Clinton also urged Northam to resign, tweeting "This has gone on too long. There is nothing to debate. He must resign."